The Tunnel hatch swung open at the given coordinates and still feeling nauseous the Wabbit lurched out. Skratch grabbed him as he keeled over. "You OK, Commander?" yelled Tipsy, keeping her colt trained on the prisoners. The Wabbit's stomach revolved like a tumble drier and he groaned lengthily. "That Time Tunnel needs stabilising." "Deep breaths, Commander," said Skratch who had more or less recovered. "Perhaps a salad sandwich will help." The pit of the Wabbit's stomach rose to his chin then dropped in free fall, but he was feeling better. "Where's this?" asked Skratch. "We're home," said the Wabbit. Skratch's eyes searched for familiar things. "I thought this was the Medieval Zone." "It's a copy," said the Wabbit. Skratch blinked because this seemed stranger than the weird places he'd just visited. "It's safe, secret and secure," volunteered the Wabbit. There was a sudden disturbance. The voice of the Tunnel boomed as it prepared to leave. "You owe 15,000 QUIDS for three trips." The Wabbit smirked. "You owe a fixed penalty for unauthorised cargo." "What?" said the Tunnel. "You can pay now," said the Wabbit, "or if you elect to contest it and are subsequently found guilty your fine will be higher." "How much?" 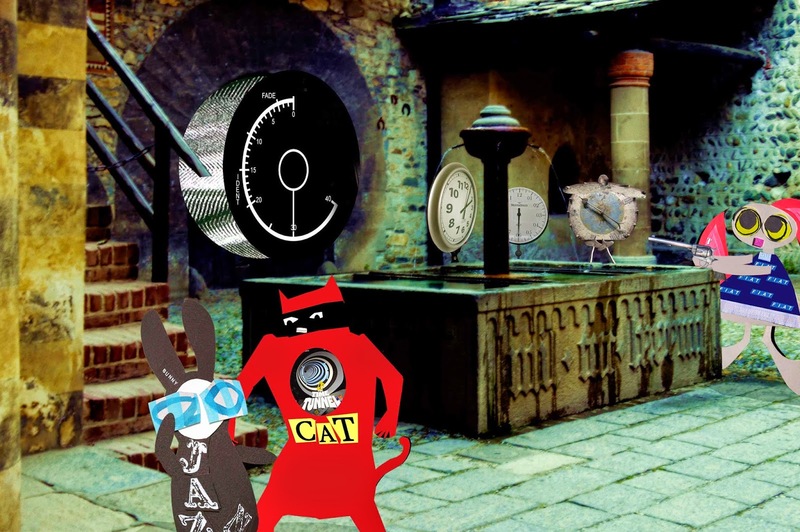 asked the Tunnel, "A zillion gabillion," said the Wabbit. "Well," sighed the Tunnel. "Perhaps this whole thing never ever happened." With a whoosh the Tunnel faded and was gone. "I made all that up," smiled the Wabbit.